Efforts to get youngsters off the streets are being taken at a Peterlee shopping centre in collaboration with local stakeholders and Durham Police. Castle Dene Shopping Centre will host sports sessions for ten to 16-year-olds in the lower ground Asda Car Park car park, every Tuesday evening, as part of a brand-new initiative to try and create positive change in young people in the area. 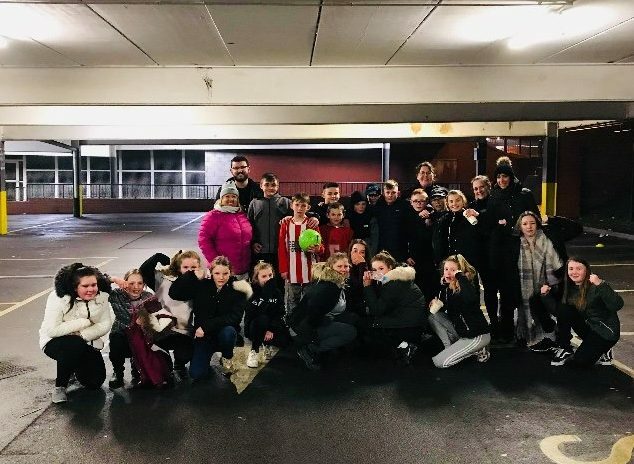 Peterlee StreetGames is a project which has arisen from the desperate need to reduce anti-social behaviour in the town centre. It follows on from the success of other local schemes that engage troubled youths such as the Groundwork Youth Provision, Peterlee Community Garden and the Sliding Door Project. Michelle Burr, PCSO, at Durham Police, said: “We believe sport has a critical part to play in addressing the issues faced by those living in the poorest communities. “We want this project to be led by young people and for them to take ownership of it, with the support of our staff, and completely make it their own. “Sport teaches key skills such as teamwork, understanding and self-discipline, brings people together, creates pride in a community, breaks down social boundaries, and inspires people to make a difference in their own lives and for others. The StreetGames network delivers Doorstep Sport initiatives throughout the country, working together to change sport, change lives, and change communities. McDonald’s and ASDA will be providing free, healthy drinks and snacks for those who attend. Suzanne Chaney, centre manager at Castle Dene, said: “It is fantastic that Castle Dene has been chosen to host the StreetGames as the centre has become a hotspot for anti-social behaviour in recent years. “Young people tend to spend their evenings hanging around the centre with nothing to do but cause trouble, so we thought why not try and engage them with something positive. The sessions are completely free to attend and will run from February 5 until May 7, with the hopes of continuing it even further if the initiative is successful and funding can be secured. For more information, visit castledeneshoppingcentre.co.uk or follow @CastleDeneShopping on Facebook.